Maybe it's because Little Inferno doesn't present the side of Armageddon that we're used to seeing in games, but you might not even pick up on its apocalyptic storyline. Yet as I burned prize after prize in my Little Inferno Entertainment Fireplace, a thought tugged at the back of my mind: why am I doing this? Why am I, a child left apparently alone in the dead of winter, burning everything in sight, then buying more things and burning them, too? Why is the Weather Man telling me to keep burning, to stay warm at all costs, that the snow shows no signs of stopping, that he can't remember the last time it did? At the end of the game, as my house burned down around me, I half expected to find a desolate wasteland and a handful of diligent post-men ("rain or shine," after all) waiting for me outside. But no, its industrial landscape appeared calm, if chilly. So why does Miss Nancy, the CEO of Tomorrow Corporation (eponymous with the game's developers) and inventor of the Little Inferno Entertainment Fireplace, flee? What is she running from? And why does she need a rocket ship to get there? Under Little Inferno's deceptively simplistic surface, I sensed a pre-apocalyptic world on the brink of another ice age. What could possibly be so bad about the planet she's already on? 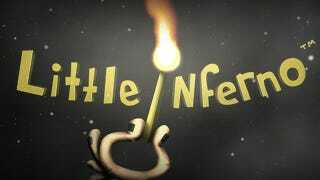 Little Inferno is not overtly a story about the apocalypse. But under its deceptively simplistic surface, I sensed a pre-apocalyptic world on the brink of another ice age. This is the story I made up in my head: with temperatures dropping and adult supervision in short supply, the forward-thinking Tomorrow Corp. sent a Little Inferno Entertainment Fireplace to every boy and girl in the hopes of staving off the end just a little bit longer. And (real-world) Tomorrow Corporation's Kyle Gabler, previously of World of Goo fame, told me during an email exchange that my apocalyptic conspiracy theory is "not off base." "The reason for the weather outside isn't ever directly stated," he wrote. "At least one character kind of muses about it, but [Miss Nancy's] also kind of a batty old lady who smells like cinnamon, so who knows." He added a ":)" for good measure. I played through Little Inferno a half dozen times, seeking answers to these questions and more: Where did Sugar Plumps, the cute little neighbor girl, escape to? Did she really find some tropical paradise? And where was the Weather Man taking me in his mysterious hot air balloon? Ultimately, I could only alter one aspect of the story, by resisting my urge to burn everything and hanging on to one lone item—a coupon for a free hug—until the final act. With this special prize in hand I unlocked the secret ending: just before Miss Nancy fled the city's impending doom, she leaned in close, ample bosom taking up most of the screen, and embraced me. It wasn't much, but in this world devoid of hope, I found it endlessly comforting, and I put down my controller at peace with my fate.